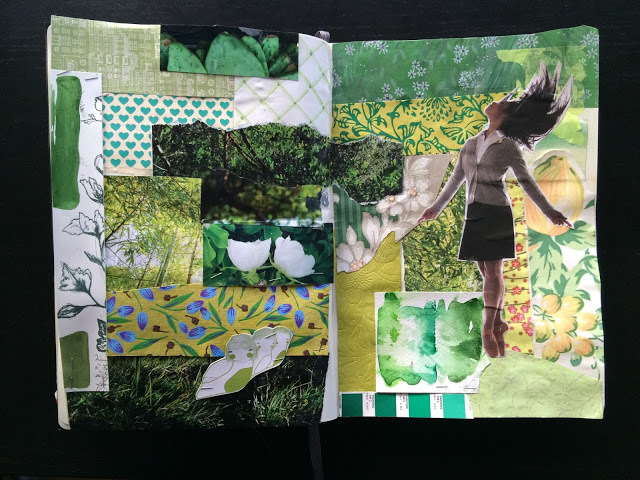 I have two spreads to share with you this week. 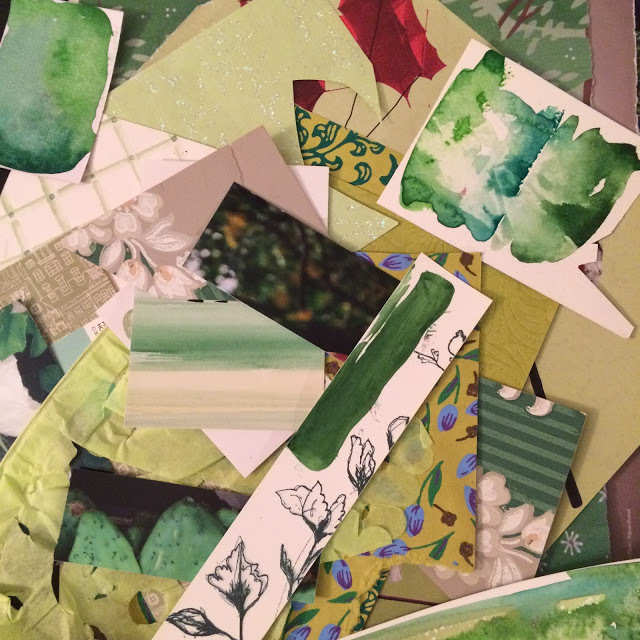 The first one involved transforming this pile of paper into an art journal page. Here is what I came up with. 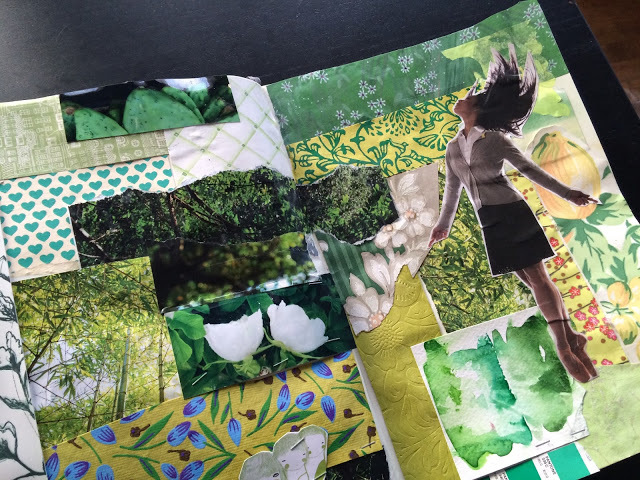 This page was a big challenge for me because I am not attracted to the color green. Which might be why I had so much of it in my stash?! I did this in response to Julia’s color psychology tutorial. 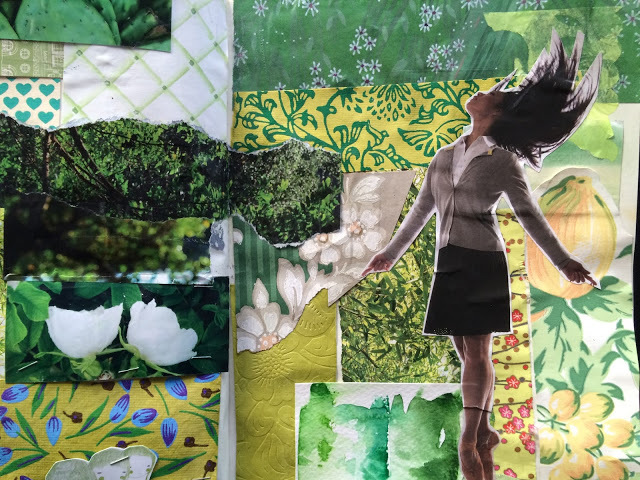 Green is a color I associate with calmness, the outdoors, serenity. Not happiness per se. 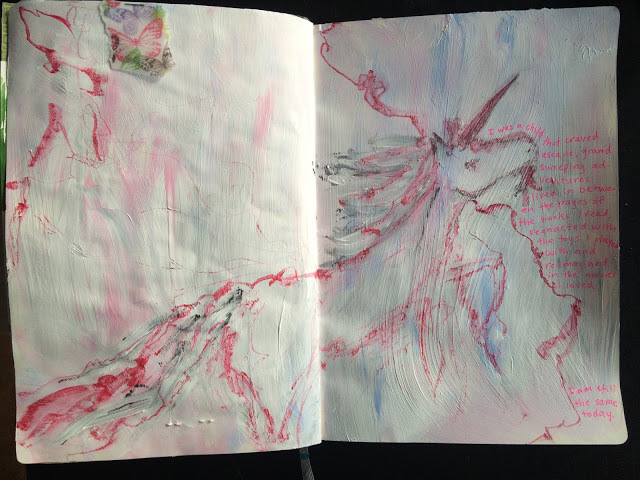 This is why I added the ballerina, as a way to make this spread happy. I’m fairly happy with this and I do like all those cutouts, but it’s still not a favorite color! (plus the fold in her legs is driving me crazy. The whole page was wet from my matte medium – glue sticks are not cutting it for me- and that fold happened without me noticing). My second spread is for the childhood prompt. 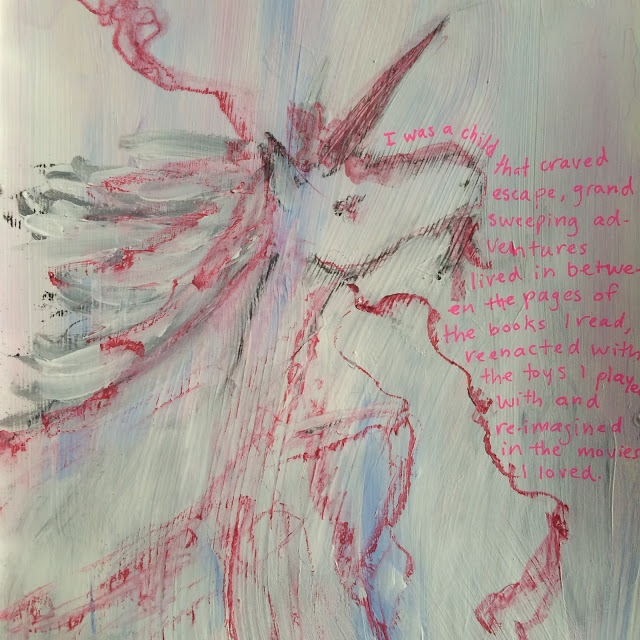 I was a child who lived most of her life in alternate realities. 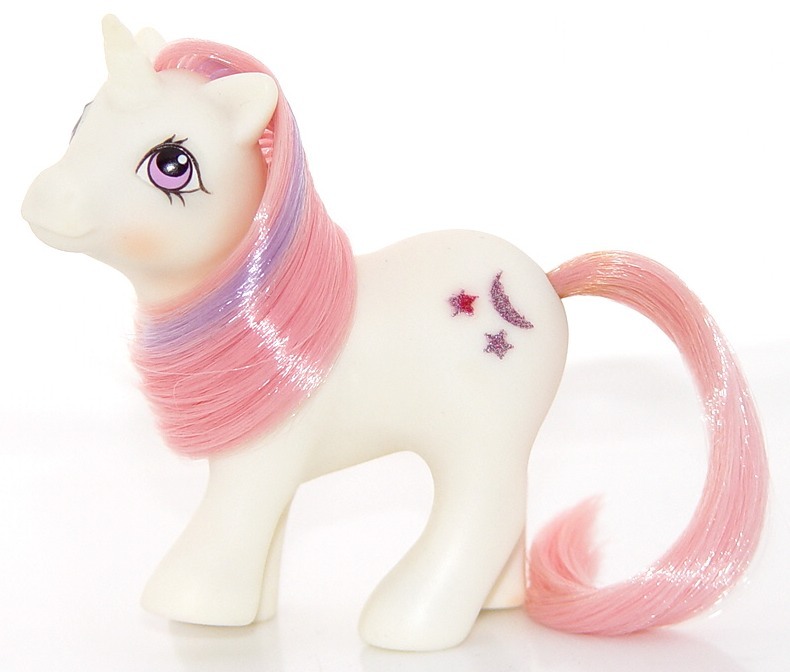 Unicorns were my constant companions and one of my favorite childhood objects is a My Little Pony unicorn. Specifically baby Moondancer. So I let her color scheme inspire me. The piece of butterfly vellum on the left is from my swap partner, Trista Hertz. 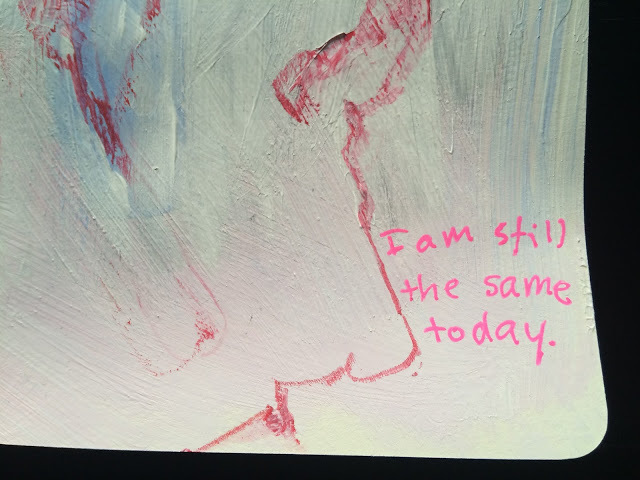 I wrote down my story next to those layers of paint and charcoal and water soluble pencil. 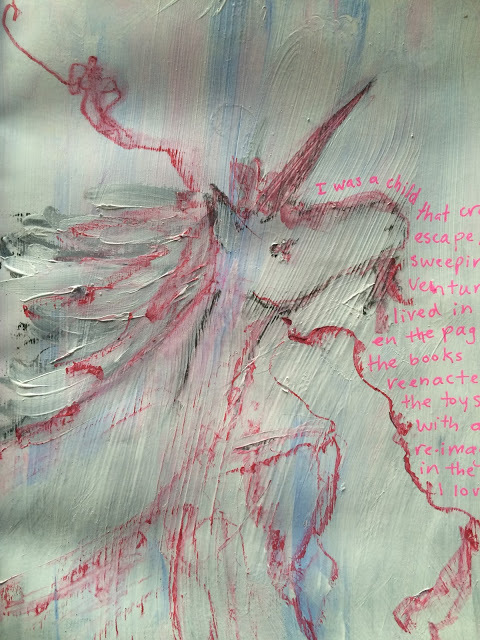 I wanted the unicorn to be unfathomable, not too clear, like our memories of magical creatures during childhood. The good news is that we are finally getting some daylight in the evenings, so I am back to photographing my pages with natural light. The bad news is that this Titanium white turned out pretty plastic-y and the light brings up a lot of the texture in the page. I’m looking forward to seeing everyone’s pages. Pétard ! C'est génial ! Mais comment réussis-tu à faire naître ce genre de page ? !